I thought this prior post was worth reposting, especially as the beautiful spring mornings and evenings are upon us! A labyrinth is an ancient symbol that relates to wholeness. It combines the imagery of the circle and the spiral into a meaningful but purposeful path. is a metaphor for life’s journey. Walking the labyrinth affords us an opportunity to go inside of ourselves and commune in the solitude of our own heart, mind, and soul. alleys. It is a left brain task that requires logical, sequential, analytical activity to find the correct path into and out of the maze. A labyrinth has only one path. It is unicursal (one way). The way in is the way out. You cannot get lost. 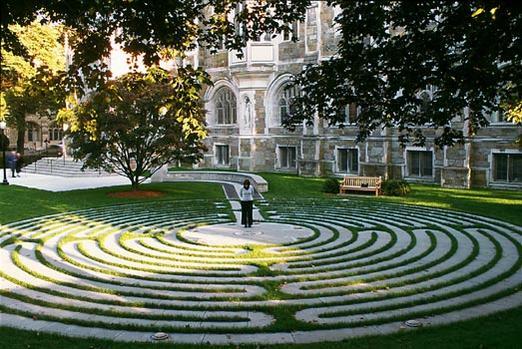 A labyrinth is a right brain task, and involves intuition, creativity, and imagery. With a maze many choices must be made, and an active mind is needed to solve the problem of finding the center. With a labyrinth there is only one choice to be made: that choice is whether to enter and walk the spiritual path. A receptive mind is all that is needed. and what they are to become. Letting go – a releasing, letting go of the details of your life. This is an act of shedding thoughts and emotions, letting the mind become quiet and empty. Illumination – the center of the labyrinth. It is a place of meditation and prayer. Receive what is there for you to receive. Stay there as long as you like. Integration – joining your Higher Power or the healing forces at work in the world. Each time you walk the labyrinth you become more empowered to find and do the work your soul seeks. Clear your mind and become aware of your breath. Allow yourself to find the pace your body wants to go. Pass people or let others step around you as it seems appropriate. The path is two ways. Those going in will meet those coming out. *Adapted from instructions by Rev Dr. Lauren Artress, Vereditas. This entry was posted in Inspiration, Meditation and tagged becoming the best you, energy alignment, labyrinth, mindfulness, moving meditation. Bookmark the permalink.